Our Virtual Branch Banking Program allows you online access to your accounts by using a PC, Mobile Phone or I-Pad. 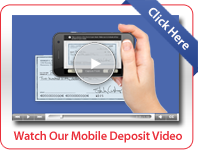 You may also sign up for remote deposit capture and electronically deposit your checks from home, work or while traveling using your Smart Phone. Please call our office at 402-399-9001 for more information.